“Real Housewives” star Lisa Vanderpump brought some humor and fun to Bravo-TV’s popular reality series earlier this year, which revolved around the endless cat-fights among a group of wealthy women in Beverly Hills. 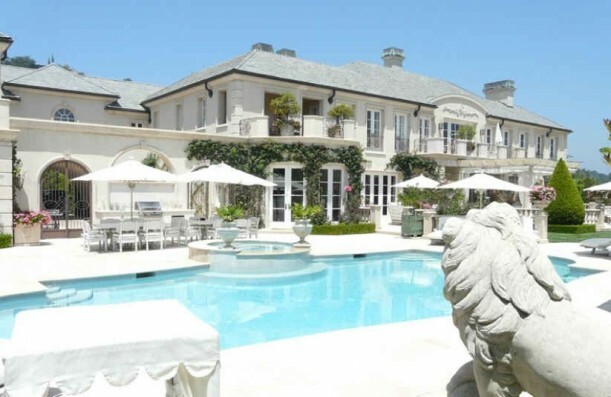 The women on the RHOBH had some seriously big houses, and Lisa’s was no exception. Now that their children Max and Pandora are grown and their famous houseguest Cedric has been kicked to the curb, Lisa says their 15,000 square-foot mansion is feeling a little too big for just her, husband Ken, and their and their 4-pound pup Giggy (pronounced Jiggy). So maybe, just maybe, they’ll sell it…assuming that the right buyer comes along, pushing a few wheelbarrows full of cash. Vanderpump insists it isn’t really for sale, despite the fact that it popped up on a real estate website that belongs to RHOBH co-star Kyle’s hunky husband Mauricio. She says it’s “just a pocket listing” to see if there’s anyone would be interested in paying $29 million for her 7 bedroom, 10 bathroom estate. The master suite alone, which is one of the areas of the house we saw the most of on the show, is 2,500 square feet. My family of four could live comfortably in that much space! How cute is he? He’s so popular now that he has his own fan site on Facebook (you can “like” him here). Paul & Jamie's Apartment in "Mad About You"
By the way, I just realize that Giggy is an actual dog!? That is even more insane. Look at the poor thing! Cute, sure, but please take off those clothes. I thought it was a toy teddy sitting there. I’m with you, Maaike, dressing the poor thing in those clothes is a bit over the top. Okay…so I know a bit too much about this little dog. He has to wear clothes as he has a skin disease and has almost no fur on his body. Without the clothes he would catch a chill in those CA air-conditioned houses and would sunburn outside. The fact that he has SO many outfits (that probably cost more than my entire wardrobe) is the over-the-top bit. guy is. I think it’s a disgrace. The dog does not actually have any fur. He has a skin problem and he has to wear clothes bc he is bald and if he is not properly covered he will get a sunburn from the harsh Cali sun or a chill from being in the air conditioning. Wow, what a beautiful home! It’s huge but beautiful and welcoming at the same time. I especially love the eating area… so cozy and pretty!!! I really like the lighting. It works perfectly in her house. I hope she as nice as she appears to be on the telly. Never watched the show. Some of the house is nice, some I didn’t like very much. Also, am I the only one that again gets a full screen Home Depot ad every time I come to this blog and have to click “continue to site”? It did it to me twice today — once at the home page, and again when I clicked to read more of the new story. Julia, I know you had a problem with this in the past, and unfortunately it’s happening again. Shame on Home Depot. I’m not seeing that annoying campaign because I use Firefox and the free Ad Blocker add-on (extension). You don’t have to put up with annoying pop-up ads on sites and can take some control and make your internet browsing safer and more pleasant. Ooh, there is so much to say, where to begin? Ok, first of all, I don’t watch any of these shows, or any reality TV for that matter. I’m loving that little dog, does he come with the house? (Not that I can afford it anyway!) And that closet! Now I want all of my clothes to be black, white, blue and pink, too! It would make shopping SO MUCH EASIER! I like the billiards room! And I LOOOVE that covered porch. Hmmmmm, I can see me now lounging away my days, perusing Conde Nast planning my next vacation, and getting my manicure, all while Jeeves the butler waits on me hand and foot. And just a mere $29 mil! No, Carol you aren’t the only one with the problem of the HD ad. I find that so annoying. Guess they’ve found a way to get around the pop up blockers this way. But the house is ok. I don’t need that kind of room, and wouldn’t want to clean it that’s for sure. But it’s fun to look. Wow. I’m not crazy about some of the gaudy decor, but I’m a huge fan of European design, so the house & landscaping are totally my taste. Thanks for sharing, as always! Not loving the pink bathroom but I could live in her closet. She is my favorite “housewife” of all time. Her house? Not so much. Where to start? Their art is horrible. All white can look great, but here it just looks unfinished. The upper cabinets in the kitchen don’t seem to “go” with the rest of the room. 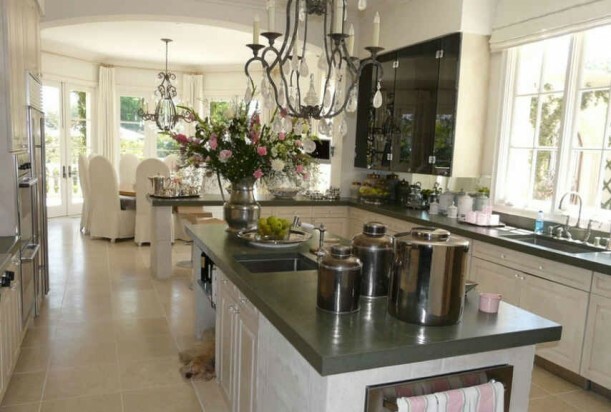 (and I agree…small kitchen for a house this size!) The grounds and that porch might allow me to overlook those things though. as to Giggie’s clothes…the poor little thing has alapecia (spelling may be off) so he “has” to wear them. That’s right. I didn’t explain that, but he’s missing a lot of fur under those cute outfits, poor pup! Not a fan of the black billiards room either, but the rest of the house has lots of windows, lots of light. I like that! I think their bedroom is the size of my whole house!! She doesn’t have a shortage of couches, does she? I liked her on the show, she seemed very gererous. Her house is lovely but too big to dream about for me . It looks like a resort. The kitchen is small when you look at the size of her home. I wonder what is in all those rooms! Never watch the show, but am I the only one that think it’s channeling Dynasty, circa 1984? I love the closet in this house! Wow! Love her home! I realized a several months ago that I watch tv and movies for the homes and lifestyle and not necessarily for the characters or plots! So yes, I love the HW’s franchises for that very reason. In defense of Giggy and his outfits, he has some sort of alopecia for dogs and scratches all of his fur off which is why she keeps him dressed. There was a whole episode about it and how the vet thought Lisa should put him to sleep because of it!! I find some of the house to be really pretty and some of it really weird. I think I’d be scared to live in such a big place, though. Nice post. I enjoyed the video at the end too. Most of the house is well done and tasteful. I agree with an earlier comment on the need for better artwork. The wine room is quite fabulous though a bit narrow if you want to move a chair after having a “bottle of wine” in a glass. The closet it very nice too. But what happened in the bathroom? Those cabinet doors look like a bored housewife took on a faux painting project, yick. Even if they were real, they are all wrong. 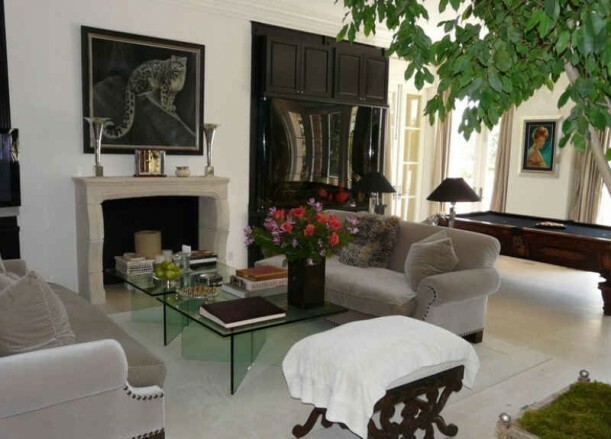 At least the home is real and reflects the owners personality, which can be a rare occurrence. Lisa definitely seems the most authentic of the bunch and they are such a great couple. Nice post. the outside spaces are my favorites…the kitchen is way underwhelming for the house…that really surprises me…good luck to her getting 29 million for it…sheesh…that’s like monopoly money to me! Lisa , YOU ARE by far the most attractive house wife and so classy . Shame about Cedric , What an idiot he was in the end. My house is 1,400 square feet. About the size of her closet! I often don’t like mansions because they’re too huge and often not decorated to my taste. But I like this house and how it’s decorated and think it’s modern and tasteful. I wouldn’t want a huge mansion and don’t need it but this is one of the nicer ones that I’ve seen. I love the closet! And I think the kitchen is gorgeous. If I did want a mansion, I’d consider this one. I managed to come up with a $20 and just need to come up with the rest. Of course I watched the Real Housewives of Beverly Hills! 🙂 I like all of the RH shows, with the exception of Atlanta, DC, and now Miami-I just can’t get into them as much as I tried to. I loved Lisa and Kyle especially. Lisa’s (gigantic!) home is absolutely beautiful, but I too am surprised at the size of her kitchen. I love her master bedroom, bathroom, and her boutique style walk in closet. So decidedly and unapologetically feminine! I’m a big fan of Giggy’s too, I follow him on Twitter. He’s so cute! Love this look of Lisa’s house Julia! I’m looking forward to season 2! I am a mega fan of the RHOBH! I loved this glimpse into Lisa’s house, Giggy is awesome too! It is hard to say which house I liked best, I think they showed Lisa’s a lot. Kyle’s was a bit too modern for my taste. Camille’s looked a bit dark and dated, but still fabulous and huge. I think I like Lisa’s the best, although there is a bit too much pink in there, but it suits her style, no wonder they call her “Pinky”. I really liked this couple on the show. And the house too. It is lovely to get a proper look at it. The one I really want to see more of is Adrienne maloof’s house. Which I guess would be pretty similar to this one. But I remember seeing her wedding dress on display, within the wall in her closet, or a hallway part of the master suite. I loved that idea. I don’t watch RHOBH or any reality shows. They are boring to me. As for the house, I’m really not a fan of the inside much. Parts of it looks like it’s stuck in the 80’s and the house is way too big. I love the covered porch though. That’s where I would spend most of my time. I know in Bev Hills more is better but why would anyone need 2 pool tables? Very pretty, but I completely agree with you about the billiard room. I love Hooked on Houses when you show homes that belong to the “normal, average American” (and some of the international homes, too), but not the homes that belong to these people. The people in these shows could not be more vain and vapid if their lives depended on it. I have to say, I’d much rather look at home designs and home make overs of people who had to work within a reasonable budget (and who had to worry about whether they were going to exceed that budget) than look at the home of someone who hired a designer to decorate it for them. It’s for this reason that my husband and I stopped watching This Old House. I really do love your site, in fact you are very near the top of my “favorites” list, but this posting of excessive people living excessive lives leaves me cold. So I’m not sure what to say about this house except I wouldn’t want to live in this decor. I think it’s almost pretty but not quite. And something about all the chandeliers bugs me. They all seem to be the wrong size – and not in an interesting way. Julia – I don’t mind the pop up Home Depot ads. I’ll happily make an extra click or two to get to your site, especially if it means the advertising will help you support your fabulous blog. …day to day life would be lonely, you’d rattle around bored because the staff takes care of everything for you. Also intercom would be a necessity to talk to your husband whose several thousand square feet away. So Lisa if ever your looking for an extra person to invite for dinner, or a week away I’d come…but wont be staying as long as your previous houseguest. I did watch this show, and this lady is my favorite of all. She has class, where some of the others are lacking. I wonder what restaurants they own? I wondered where their money came from. My Most favourite house wife of them all , classy , non assuming , gorgeous looking , lovely dogs . wish the show hadnt ended , i could watch that all day long. Oh, and that dog is the cutest thing! He looks like a little Teddy Bear. …. I want her closet!!!!! It’s a dream! Hate to admit that I even watch this show, but I do and Lisa is my favorite RHBH. She is extremely generous, and is quite the observer, snapping off quick asides, but she has a heart and will come to the defense of any of her castmates if she detects unfairness, whether she likes them or not. As for her house, it is simply gorgeous, but way too big for my tastes. Love the photos! Great post, as always, Julia! Lisa was my favorite Beverly Hills housewife. I actually really like her which is more than I can say for most of the housewives. I was watching Orange County housewives the other night and thinking…I don’t like any of them…not even one little bit. I actually can’t stand them. Why am I watching. But Lisa I like. Love her clothes and her house and her restaurant and Giggy! I just had to come back to share this. Some friends of mine are wrapping up a Los Angeles vacation and had lunch at Villa Blanca over the weekend. They were lucky enough to run into Lisa, her husband, and Giggie there and report that she is even more beautiful in person and was very nice and gracious to everyone. Dear me. Well, for starters, she seems like a lovely person in the video, and very blessed to have so much bounty in her life. And, in all fairness, I have never watched her show or any “reality” show. 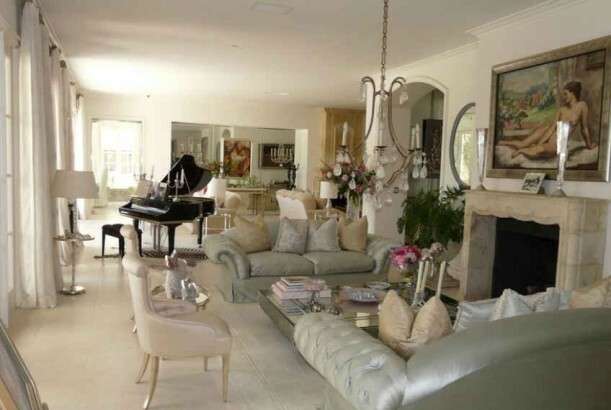 But in the kindest, least offensive way, the furniture seems rather low-end in a very high-end house, kind of like they got it from a recycler of goods from refurbished hotels and then they just had everything covered in white. Definitely very 80’s. Or is it just me? Otherwise, this house is very cold-feeling to me – but marble (or travertine or whatever it is) flooring throughout usually does that to a house. I do agree with the comment about the chandeliers being disproportionate…and they have duplicates and triplicates of the same style. Did they just move one chandelier from room to room, one wonders? Anyway, thanks for the very entertaining post! Do you have any info on Lisa’s new house? Is there any chance we will be treated to pictures of their new home, Villa Rosa? I just caught a glance of her backyard on last nights show, so did anybody notice those like double umbrellas & where can I find some? Loved them I think? Need a better look.